From feedback we have received from a number of CTH accredited centres about the overlap of our exam sessions we have made the decision to move to four assessment sessions starting in 2019. The timetable below shows the qualification and assessment registration deadlines, and the assignment submission and declaration of results dates for 2019. The weekly timetable showing which CTH Management qualification exams are available each day has not changed. CTH Culinary and Career Skills Programmes offer a variety of assessment dates depending on the particular programme, which are agreed with CTH six weeks in advance. Please contact your Approved Teaching Centre for dates. 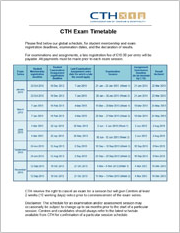 Listed below is the CTH global schedule for examination and assessments for Management Programmes, including deadlines for qualification registration, assessment registrations, submission of centre-marked and internally verified assignments to CTH, exam dates and dates for the declaration of results following the CTH Exam Board meetings. Qualification Certificates are usually issued ten working days after result are declared. Each exam session will have exams from Monday to Thursday. A late registration fee of £10.00 per student/unit entry applies to assessment registrations received after the deadline but by the late assessment registrations deadline. All payments must be made prior to each exam session. CTH cannot guarantee to accept late registrations, especially those made close to the scheduled date of the examination or assessment. Marking of assessments is available ‘on demand’ through our fast track process, this incurs an additional fee. CTH reserve the right to cancel any examination for a session but will provide Approved Teaching Centres at least 2 weeks (10 working days) notice prior to commencement of the exam series. 1 week for courses lasting less than 3 months. *Exam dates for all other exams are set by centres but must be notified to CTH at least 6 weeks in advance. Click on the image to the left or the title above to download full details of our 2019 examination and assignment schedule.